Listed below are my 2014 Defensive Lineman Rankings for IDP Redraft Leagues. I will continually update these throughout the off-season to reflect changes in free agency, defensive schemes, playing time, draft selections, etc. 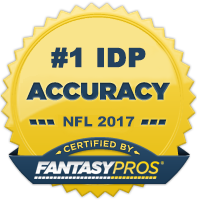 However, keep in mind that the information listed here is just a small sample of a much larger set of rankings and descriptions that are accessible through purchasing my 2014 Fantasy Football Draft Guide. 1. RDE J.J. Watt (HOU) - There's no doubt that Watt was a fantasy disappointment to those who spent a 2nd or 3rd round draft pick on him last season. His sack total in 2013 was nearly half of what is was in the previous season as teams heavily game-planned against him. Although I am initially a bit concerned the effect Romeo Crennel and his archaic 2-gap principles will have on Watt (no defensive end has registered double digit sacks in his 19 year NFL coaching career) his upside and talent is too large to pass up. Additionally, the return of Brian Cushing should help alleviate some of Watt's pressure. At the very minimum, Watt should be the second DL taken in drafts behind Robert Quinn. 2. RDE Robert Quinn (STL) - What an impressive year for Quinn: 50 solo tackles, 19 sacks, and 7 forced fumbles. He was also a model of consistency throughout the season registering a sack in every game except 5 and never going longer than two games without a sack. New defensive coordinator Gregg Williams will continue to run an aggressive attacking style defense which will keep offenses honest and help Quinn continue to get to the quarterback at an outstanding clip. 3. RDE Chandler Jones (NE) - Jones led all defensive linemen in snaps played with 1,124 which helped him amass 79 total tackles to go along with 11.5 sacks. It also caused him to wear down towards the end of the season as he only registered 1 sack in his final 5 games. Nevertheless, Jones was still a top 5 fantasy DL and I see no reason why he won't be again this season. Just be aware that he may be a good sell high candidate come mid-season if the Patriots continue to play him on a near every down basis. 4. LDE Greg Hardy (CAR) - Hardy exceeded the lofty expectations placed upon him last year by finishing 3rd in the NFL in sacks with 16. Granted seven of those sacks came in his last two games, but that aside, he's proven to be one of the most consistent fantasy options at the position. He's currently playing under the franchise tag but figures to sign a very lucrative long-term contract at some point this off-season. That fact shouldn't stop him from remaining a DL1 option moving forward, however. 6. RDE DeMarcus Ware (DEN) - Ware landed in a very nice situation in Denver. He will have all the motivation he needs to put up DL1 numbers after being released by the cash-strapped Cowboys in the off-season. Playing opposite Von Miller will give him the most one on one opportunities he's seen in his career. With the Broncos likely to be up in a majority of their games, Ware should see a very healthy amount of pass rushing opportunity. Despite being 31, he's locked into the elite tier of linemen once again. 7. LDE Rob Ninkovich (NE) - In large part due to his hybrid role, Ninkovich led all "defensive linemen" in total tackles with 91 (49 assists). He also added a respectable 8 sacks to his totals which helped him climb to a top 5 finish in the majority of scoring systems. He's one of the safest plays on the board and can be trusted to produce like a DL1. 8. LDE Calais Campbell (ARI) - Campbell set a career high in sacks with 9.5 last season and continued his steady tackle production. Along with J.J. Watt, he's become a shining example of how certain players are redefining the 3-4 defensive end position. He's been one of the most consistently productive ends in the league over the last handful of seasons and I expect that to continue in 2014. 9. LDE Carlos Dunlap (CIN) - After 3 years of playing limited snaps, the Bengals finally loosened the reigns on Dunlap and let him play full-time (87% of the team's snaps). He rewarded fantasy owners with 39 solo tackles, 19 assists, 7.5 sacks, and 4 forced fumbles. He's just 24 years old and is still honing his skills. He has some of the highest upside of any defensive lineman in this range. 10. LDE Muhammad Wilkerson (NYJ) - In just his third season Wilkerson has already established himself as one of the most dominant and disruptive defensive forces in the league. He's built upon his numbers in each of those years and has a good chance to again in 2014. His role limits the amount of huge fantasy games he will have but that's offset by his steadfast consistency. One of the best high-floor options who still has nice DL1 upside. 12. DE Mario Williams (BUF) - Although Williams surpassed expectations with 13 sacks, his tackle numbers held him out of DL1 contention. 38 total tackles in over 1000 snaps played put Williams in the bottom ten in the category against all players with 500 or more snaps. Until he improves his play against the run, he's more of a DL2+ in my book. Bump him into the top 8 in big play scoring systems. 13. RDE Cameron Jordan (NO) - In all honesty, I didn't think Jordan could thrive in Rob Ryan's defensive system. However, I was proved wrong. He posted 12.5 sacks and has quickly developed into one of the premier 3-4 pass rushing ends in the NFL. I'm sold. One of the better plug and play DL2s in the game. 14. RDE Charles Johnson (CAR) - "Big Bully" struggled through some injuries during the second half of the season which caused his numbers to fall off dramatically the last 8 games of the year. He's one of the best in the game at getting to the quarterback but his lower than average tackle numbers in recent seasons mitigate his overall value. He's a strong high-end DL2 with upside and should continue to be so especially with Greg Hardy returning to Carolina this season. 16. LDE Geno Atkins (CIN) - The start to Atkins' 2013 season was a rough one to say the least with just 1 tackle and 1 sack in his first three games. Over the next several games the sacks began to flow; however the tackles were few and far between. Then he suffered a season-ending ACL injury. All of the aforementioned factors will combine to make him a somewhat risky draft choice for owners this year. But there are question marks for a lot of the guys in this draft range and Atkins has the surrounding cast and talent to put up top 10 numbers from the DT spot which is invaluable in some leagues. 17. LDE Michael Johnson (TB) - Tampa should wind up being a very nice fit for Johnson. Leslie Frazier's defense doesn't utilize the blitz much and instead relies on pressure from the front four so bringing in a serious pass-rushing threat was a must. There's an argument to be made that Johnson was overvalued in this market and has yet to live up to his hype. There's probably some validity in that statement, but he's shown he's both a stout run defender and game-changing pass rusher at various points during his career and has the talent to be a DL1. His inconsistencies drag him down into the bottom end of the 3rd tier for me, but there are some instances where his upside may drive owners to reach for him a couple spots earlier. 18. LDE Jared Allen (CHI) - After a long and lustrous career in Minnesota, Allen will be moving on to division rival Chicago. There's no doubt age and injuries have started to take a toll on Allen's production as both his sack and tackle numbers have started to dwindle in recent years. However, his year ago numbers of 50+ total tackles and 10+ sacks are still solid numbers for a DL2+. Allen has been one of the most consistent fantasy options over the last decade and that's worth something in the eyes of fantasy owners. 19. LDE Chris Long (STL) - 2013 marked the 4th consecutive season in which Long has put up 8.5 sacks or more. The tackle numbers are average at best, but with teams likely to focus a TON of attention on Robert Quinn moving forward, Long could easily post 12+ sacks this year with 35-45 total tackles. 20. LDE Lamarr Houston (CHI) - Houston has matured into one of the more versatile defensive linemen in the league over the past four seasons. He set career highs in both tackles (69) and sacks (6) last year and graded out as a top 10 defensive end according to Pro Football Focus. Houston's value should remain relatively consistent in Chicago with what it was during his time with the Raiders. Expect him to be an every-down player splitting time between defensive end and tackle. His above average tackle numbers along with the expectation of a handful of sacks place him in the top 25 players at his position.